Yonex badminton racket string in either 200m or 10m lengths. 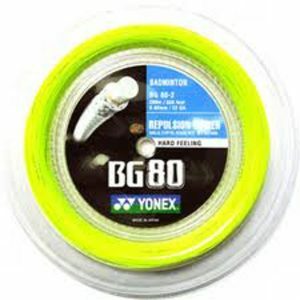 Choose from BG65Ti one of the Yonex’s most popular and durable strings offering good repulsion and great durability. 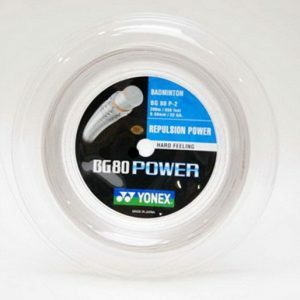 Or what about the BG80, a string which provides added power. 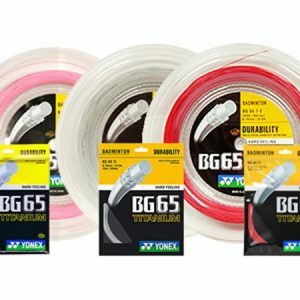 BG65ti string includes a compound titanium hybrid coating which provides a sharp but comfortable feel at impact. It is designed for hard hitters. 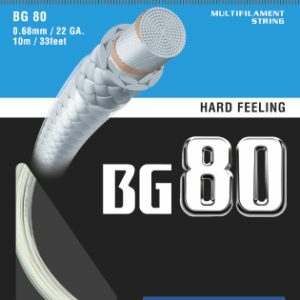 BG80 has a high-modulus Vectran fibre (an advanced material) wrapped round a strong multifilament core. As a result is gives high repulsion for those hard hitting players.